Despite the fact I use it in the title of this very website, I’m a little wary when it comes to multiversal stories in superhero comics. 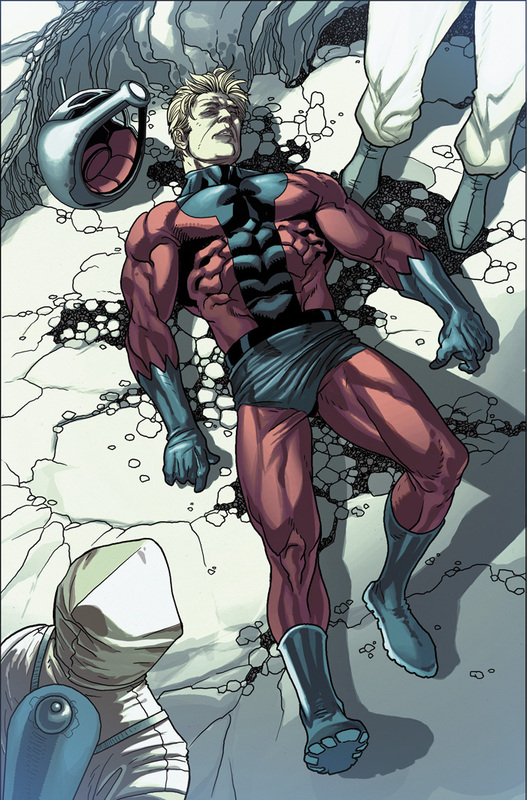 It’s a thread the current New Avengers run has been following to good effect, charting the death of universes with Earth is the possibly-sorta-maybe focal point and showing us literal other worlds that could have been. 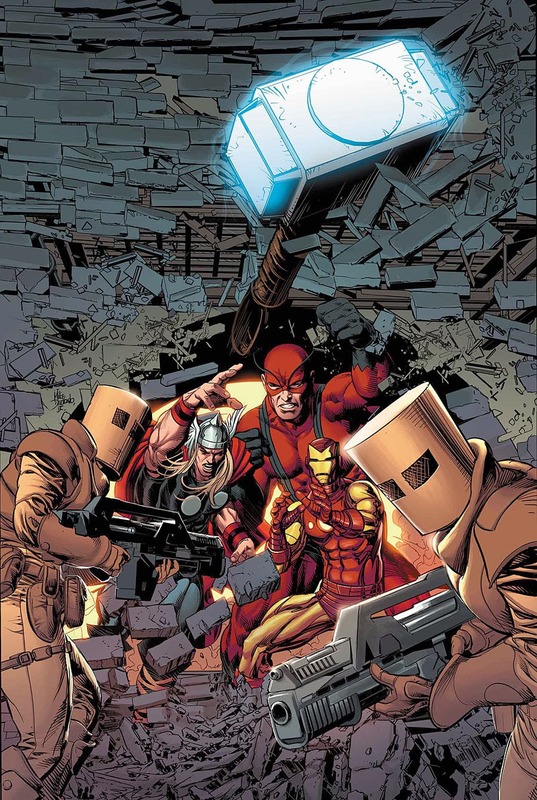 It’s a thread I wouldn’t expect in Jonathan Hickman’s vanilla Avengers run; while it does have sort of an intertwining story with New, the book seems to be mostly doing its own thing and being a bit more accessible to casual fans. 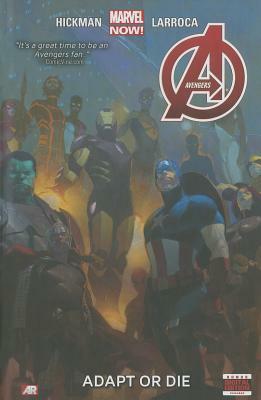 So when an alternate reality version of the Avengers show up, murderously antithetical to the originals we know and love, the book threatens to veer off into “too comicky” territory the same way Brian Bendis threw his hands up and just made All-New X-Men crazier than a bag of Republican cats. Granted, it’s not like Avengers has been entirely gunmetal and serious in recent volumes, and Hickman isn’t exactly known for plots lacking in esoteric quality. But it’s a much more involved affair than other runs I’ve read, and I was worried it’d push the insanity button too hard by having Tony Stark face-melt a mirror counterpart who’s actually a savagely homicidal Jarvis in an Iron Man suit. Thankfully, even though that’s a scene Adapt or Die plays out, we don’t get quite that far into Crazyland. I was ready to just write up Adapt or Die as another solid entry in Hickman’s Avengers body of work, but the more I read the less I got the sense that this is playing ball with his earlier style of writing. The Avengers Machine preceding each entry is gone, and a number of the supporting characters he fleshed out have either had their facetime lessened or just dropped off the map entirely (probably to go join that Avengers World book). The slightly slice-of-life approach some of the chapters had, detailing one-off adventures amongst the larger Builders/Infinity plotline, are gone. We’re moving towards something big, and the story is starting to…well, condense is the wrong word, but it’s along those lines. Adapt or Die consists of two stories; one chapter at the beginning deals with a rogue planet shot like a bullet at Earth that ends with an ominous warning for Iron Man about the dark future to come specifically for him. The other story follows the aforementioned evil-bearded doppelgangers arriving from a dead universe thanks to some A.I.M. shenanigans, and the larger implications their inception to our world present. Though both narratives get more or less wrapped by book’s end, you get the feeling – especially since this is a Hickman work – that this is merely the tiny pebbles preceding an avalanche. I’m a little annoyed the second-tier characters Hickman put quite a bit of time into developing aren’t here as much, despite Hyperion making a few things happen here and there, because they added a different flavour to what might have otherwise been a fairly standard “every hero who has a movie out right now” team-up book. 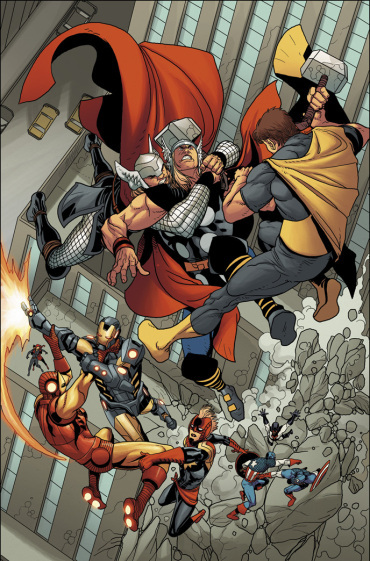 Hickman can definitely write the major players, but I feel a bit of the unique identity’s been lost by focusing primarily on Tony, Cap and Bruce Banner rather than Sunspot or Cannonball. Yes, I know, the latter’s names are ridiculous even for superhero nomenclatures, but that was part of the appeal, dammit. Despite that, Adapt or Die is an intriguing “shape of things to come” moment that especially crystallises during the dire prediction given to Tony near the beginning that, soon, everybody he knows will be trying to kill him. As with my complaint above about dropping other characters, this warning comes a little for left-field for a book that’s not ostensibly an Iron Man-centric story, but I’m intrigued to see where that goes. Could Hickman be finding a way to deliver some long-overdue extra karmic payback for the crap Tony pulled all those years ago in Civil War? I’m not sure, but I’d bet there’s at least one fan conspiracy website out there purporting that this is where we’re headed. Art is handled solely by Salvador Larroca, who I’m glad to see is getting work following his excellent illustrations throughout Matt Fraction’s Invincible Iron Man run. The faces and costumes look great, and there’s some especially excellent work delivered during an end-of-book lecture Bruce Banner delivers to Tony that conveys most of the former’s intent and the latter’s guilt merely through facial expressions. I’m always a big fan of Larroca, so I hope he’s sticking around for whatever’s next in the run. Dialogue doesn’t quite feel like a Hickman book the same way New Avengers has recently, meaning a distinct lack of terribly overloaded exposition and some mostly down-to-Earth grounded word work that seems more of a Kelly Sue DeConnick or Matt Fraction caliber. The opening Avengers Christmas party on the roof of Stark Tower was a neat little character moment (and am I the only one who would jump at the chance to try a Thor-made beer pie?) and, once again, that lecture Banner gives at the end was fantastic from a visual and dialogue perspective. That said, the latter does lose a bit of its impact if you’re not flush on New Avengers‘ recent happenings, but I guess even without context it’s still some great interplay between two of Marvel’s best-written characters. If rumours are even a little true, then we’re due for something big to happen in May next year when Hickman’s twin Avengers runs come to their respective ends. Common suggestions are a reboot or relaunch of reset or re-somethingelse that’ll occur during the end when, according to ominous Marvel marketing slogans, “Time Runs Out“. 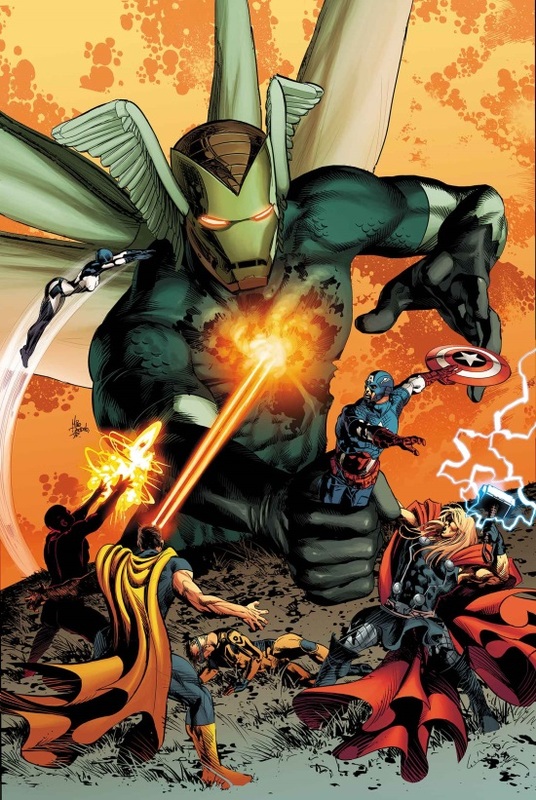 If it’s true, I’d say we’re seeing the first minutes of that time start to leak from the hourglass; Adapt or Die‘s ending strongly hints at a ‘beginning of the end’ style of storytelling, and over in New Avengers we’ve got the distinct impression we’re nearing the end of the multiversal death throes. Now it’s up to Hickman and co. to show us what’ll be born in the aftermath.